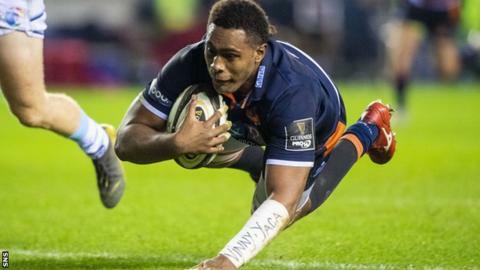 Edinburgh's Fijian number eight Viliame Mata has signed a one-year contract extension to commit himself to the capital club until at least 2021. Mata, 27, has played a pivotal role in their run to the European Champions Cup quarter-finals this season. Mata - known as 'Bill' - was already contracted until the end of next season but has extended his deal in a major boost to head coach Richard Cockerill. "Vili is one of the most exciting talents in the world," he said. "I'm delighted that he feels that his future is here in Edinburgh. We love him, and he thrives in the culture we've created around him. "He's still a young man, so I'm looking forward to seeing what he produces in an Edinburgh jersey in the years ahead." Mata won an Olympics gold medal with Fiji's sevens teams in Rio in August 2016 before joining Edinburgh the following month. "I've had a great time in Edinburgh over the last two seasons," he said. "We've settled in well and my family loves it here. We're excited and blessed to be staying in this city for another two seasons. "The club is definitely growing and I'm so excited to see how we can keep improving. I'm still getting used to the weather here, but I've got another two seasons to keep adapting. "I feel like I fit in really well here and the boys always make me feel right at home. Edinburgh has truly become a second home for my family and I." Edinburgh, who lost their first home game of the season against Cardiff Blues on Saturday, travel to face Benetton in the Pro14 this Saturday, as they build towards a Champions Cup last-eight date with Munster on 30 March.